Ferplast Pig Cage, Grey, also referred to as Cavies 80 is one of the most dated and the most popular guinea pig cages in the market today. Though traditional, this cage comes with a great design that makes not only the pets comfortable but also the pet owners. Like any other modern cage, Cavies 80 comes with all accessories needed to make the life of a pet fun. Pet owners have the choice of choosing the model of the cage they need in respect to the size and the number of pets. To this end, Ferplast Pig Cage, Grey can be said to be customizable, a factor that makes it the ideal cage for hedgehog pet owners. Though initially designed for guinea pigs, this cage can accommodate other pets such as hedgehogs. 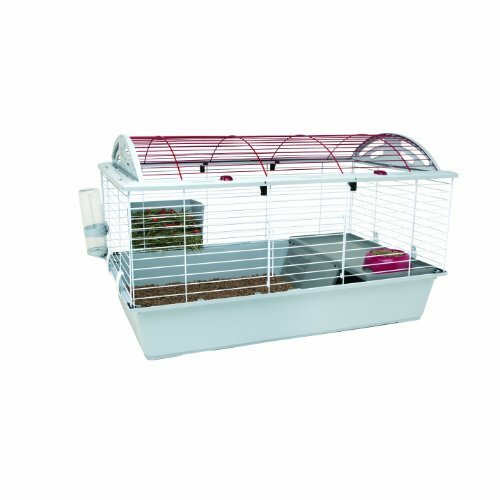 The design of this cage is in such a way that it offers all accessories and features that make merry the life of pets. The features are as explained below. Ferplast Pig Cage is offered with a wire mesh narrow enough to accommodate hedgehogs, small sized pigs and bunnies. The wire is coated to make it rust-proof and increase the cage’s durability. The wires are chew proof guaranteeing the security of your pets. The gray wire mesh that forms the top of the cage can be detached from the bottom which is plastic. The plastic bottom makes it easy to clean, provides a sturdy ground for the pets and is easy on the feet of the pets. The plastic is high quality and thick to ensure that pets do not chew through and create holes. For ease of access, Cavies 80 comes with a large opening front door. This door makes maintenance easy; allows the pet owner to feed pets, take them outdoors, clean the cage, empty feeder and water bottle and fix shelves. Opening and closing this door is easy thanks to its hinged design. Ferplast Pig Cage, Grey, comes fully accessorized with a hay feeder, a water bottle, a guinea pig home and a bowl. These accessories are fixed to ensure pets do not spill food or water. The accessories are made of strong and high-quality plastic to warrant their durability. To give your pigs enough fun while in the cage, Cavies 80 has shelves fitted on the high walls. These shelves give the pet enough room to climb, exercise and roam. There is also a separate house where a guinea pig can spend its night warmly and comfortably. Ferplast Pig Cage, Grey, measures 30.3 inches by 18.9 inches by 16.5 inches and weighs 8.5 pounds. The cage comes ready to assemble with each part foldable for easy storage. The cage can be assembled in minutes, and no tools are required for the assembly. It has enough room to accommodate two or three hedgehogs and conforms to all recommendations from breeders and veterinarians. Though this cage is traditional, it offers all the necessary modern features to keep pets and pet owners happy. It has had a good number of positive reviews on Amazon and on other third party review sites making it an ideal cage for hedgehogs. Its simple design and its ease of assembly make it fantastic. Pet owners looking for a simple cage for their hedgehogs will love Ferplast Pig Cage, Grey. The cage measures 30.3 inches by 18.9 inches by 16.5 inches and weighs 8.5 pounds. Ferplast Pig Cage, Grey, also referred to as Cavies 80 is one of the most dated and the most popular guinea pig cages in the market today.